BROOKFIELD, Ill. (WLS) -- The Brookfield Zoo is exhibiting the endangered pangolin for the first time in the zoo's history. The anteater-like animal is native to Africa and Asia. The Chicago Zoological Society, which manages Brookfield Zoo, has had 13 white-bellied tree pangolins at the zoo since April 2016. Currently, only one male may be seen by the public. 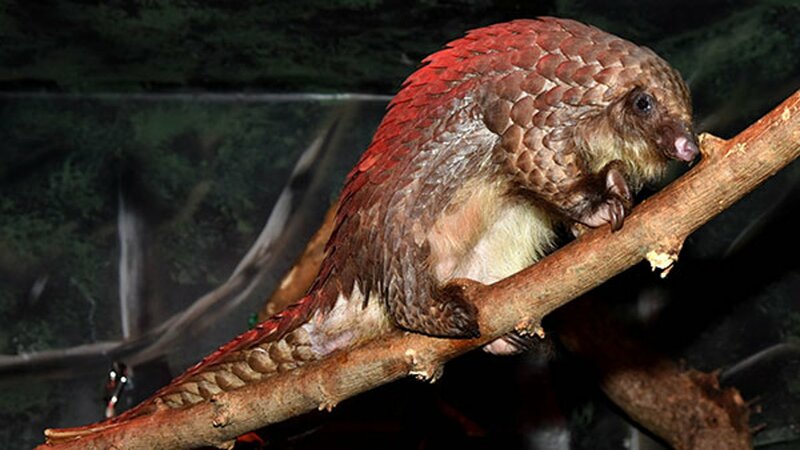 Four species of pangolins are native to Asia and four are native to Africa. All eight species are facing extinction. Over the last 10 years, more than a million pangolins have been poached from the wild. The animals were hunted for the bushmeat trade, for their scales and for their use in Asian medicines. Brookfield Zoo is currently working with five other zoos and one not-for-profit on conservation efforts for the pangolin, along with the University of Lomé in Togo, West Africa. Pangolin have a cone-shaped head and tail that can grasp things. Their body is covered with hard scales made of keratin. Much like anteaters, they have a long tongue covered with sticky saliva that's used to scoop up ants and terminates. Adult pangolins eat up to 20,000 ants and termites a day. Baby pangolins are born with soft scales that harden after a few days. Because they don't walk for four to six weeks, they travel by clinging to their mother's tail.